The Mill is surrounded by 4.5 ha of woodlands and meadows and stone deep protected water well and two ponds often frequented with wild Ducks. 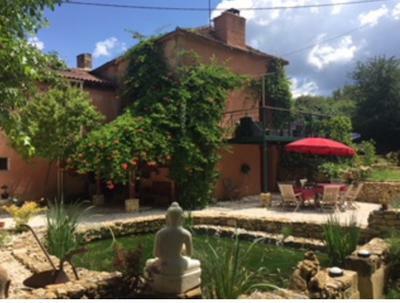 The Mill is situated near the source of the river Dropt and is within 5 minute walking distance of the historic and beautiful Bastide Monpazier, one of the most beautiful in France. The property is in a prominent position with excellent, if so desired, business potential. At present the Cottage and the Studio are being used as AirBB. The Barn has two floors and has been tastefully renovated and is clad in oak. The other large outside Barn has an fully operational outside kitchen. There is a large pool surrounded by a wooden deck and a barbecue area. There is a pottery studio with wheel and kiln and obviously water and electricity on the edge of the bamboo forest on the land. The exterior of the Mill is in good condition. In the Mill there are three ensuite bedrooms and ample space to create two more one the Mezzanine 's of the Barn. A large attic running the length of the house which is fully wooden clad functions as a large playroom or dormitory sleeping seven. The lovely fitted kitchen with wood and ceramic work-tops has a great wood burning stove, there are beautiful beams throughout the house. 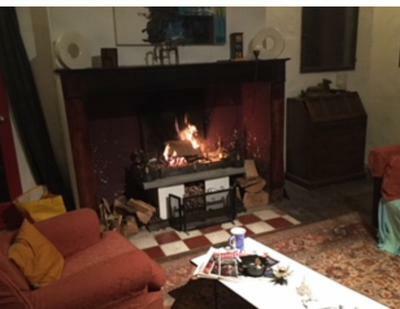 The living room has a large open fire and a spacious walk on veranda. There is a fully "stocked" workshop with all essential garden and work tools. On the land there are many fruit trees, Apple , Pear, Plum and a even a small Fig Tree and Two fruit bearing Vines. The pond near the house has beautiful Koi and a variety of gold fish. The Mill is only 21 KM from Bergerac international airport which serves Amsterdam and London amongst many others on a daily basis. 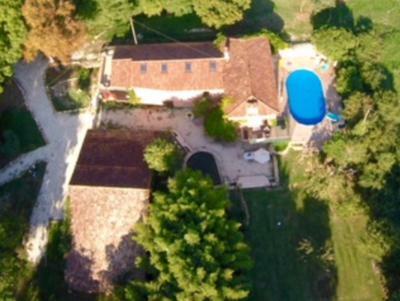 Although the Mill is within walking distance of Monpazier it's wonderfully sheltered by trees, feels rural and it is situated in a very quiet location. Monpazier has all necessary facilities including two small but well stocked supermarkets. The Mill comes with a Landrover Defender 90 (and trailer), a Betoni designed convertible Fiat Punto and a ride on mower/tractor. We are open to "a swap" for a property on the coast in Southern UK and or Wales. With fully equipped outdoor kitchen, fridge and barbecue.. Attached to the Barn are tree seperate rooms functioning as storage space. Water and electricity runs up the hill so a potential cottage can be "supplied"